Tomorrow i.e., on 30th June 2014 – around 9.52 am – look towards the sky and the Nation should be feeling the pride…. In his first trip to the south after he assumed office, Prime Minister Narendra Modi arrived here today (29th June 14) on a special aircraft enroute to Sriharikota to witness the launch of ISRO's PSLV C-23 rocket. It rained here somewhat heavily for few minutes and reportedly the Prime Minister's special aircraft landed after a delay of 40 minutes following bad weather, after which Sri Narndra Modiji was welcomed by Tamil Nadu and Karnataka Governor K Rosaiah and Chief Minister J Jayalalithaa in the VIP lounge, airport sources said. Later, Shri Modi left for the spaceport of Sriharikota, about 100 kilometres from here, where he is set to witness the launch of ISRO's PSLV C23 carrying five foreign satellites tomorrow. 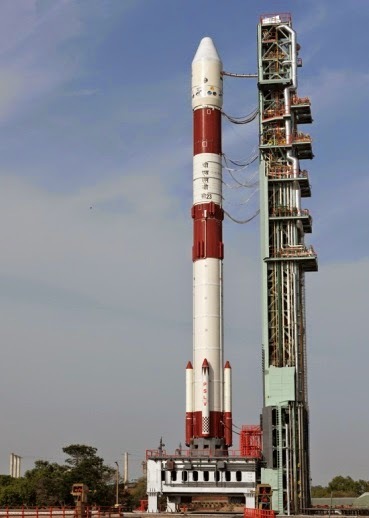 PSLV C23 is scheduled to lift off at 9.52 am tomorrow with 714 kg weighing French Earth Observation Satellite SPOT-7, 14 kg AISAT of Germany, NLS7.1 (CAN-X4) & NLS7.2 (CAN-X5) of Canada each weighing 15 kg and the 7 kg VELOX-1 of Singapore. The Polar Satellite Launch Vehicle, (PSLV) is the first operational launch vehicle of ISRO. PSLV is capable of launching 1600 kg satellites in 620 km sun-synchronous polar orbit and 1050 kg satellite in geo-synchronous transfer orbit. In the standard configuration, it measures 44.4 m tall, with a lift off weight of 295 tonnes. PSLV has four stages using solid and liquid propulsion systems alternately. The reliability rate of PSLV has been superb. There had been 25 continuously successful flights of PSLV, till April 2014 .